Your PPC campaign drives customer traffic to your website. However, traditional ‘’Search Network Only’’ PPC methods do not yield the desired results any longer due to its overuse. Therefore, it makes sense for your startup to take advantage of Display Select Keywords tool, which is the latest entrant in PPC campaigning. What is Display Select Keywords? In the traditional PPC ways, search engines placed your ads on the search result pages only. Display Select Keywords tool shows your ads inside websites that have content relevant to your business. This means that customers visiting the sites having content related to your business will be able to see your ads. PPChero.com reveals that ‘Display Select Keywords’ is far more result-oriented approach than the traditional PPC campaigns. When you start using ‘Display Select Keywords’ in your PPC services campaign, you enhance reach of your ads. Your ads target new audience. Your ad placement is decided after knowing your target market. People seeing your ads are your target audience since the ads are displayed on websites that are related to your startup. Many of these people are likely to buy from you as they are looking for your type of products or services. So, along with a professional website design, you need to target audience with right placing of your ads. Display Select Keywords is flexible. You can display your ads in different formats including images, videos and animations besides text. This allows for a precise market research. With Display Select Keywords, a window of marketing opportunities is opened for your startup. Display Select Keyword tool, according to Google, can increase click-through-rate by 35% and decreases cost-per-conversion by 35%. This innovative way of PPC helps you spend less money on your PPC campaign and get better results, quickly and conveniently. 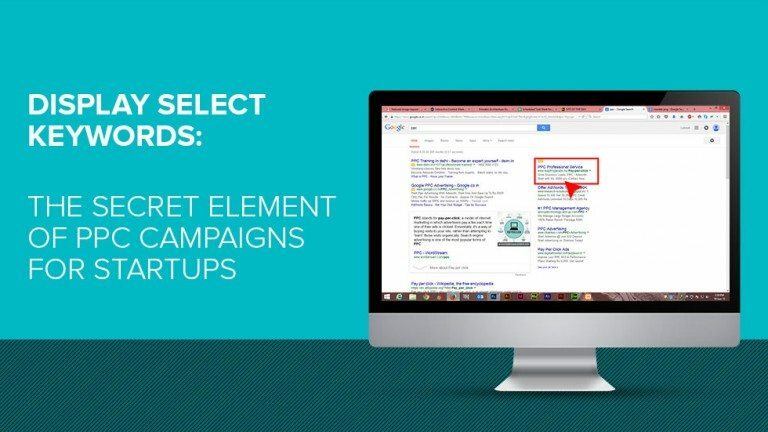 With little efforts, you can change your PPC campaign to a Display Select Keywords Campaign. But you need to figure out how to use the tool effectively. It makes sense to adopt a trial and error approach to know what’s working and what’s not working for your startup. Remember, PPC is the best advertising tool to get thousands of visitors on your site. If you can manipulate this PPC technique rightly, you can easily get thousands of visitors to your website. Looking for Customized, On time, Graphic Designs? Launch a contest today. Get Your Logo Design Now! Next Next post: How Buying Likes Hurts Your Dating Startup Facebook Page?